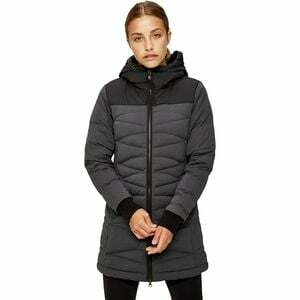 Sleek and stylish, the Lole Women's Faith Down Jacket looks at home on city streets and gym commutes, with lofty 500-fill down insulation to keep you warm on the coldest days, and a durable, water resistant and breathable outer material for full protection against anything that winter throws your way. The two-way zipper adds mobility, whether you're walking to work or hopping in the car, while generous hand pockets accommodate your chilly fingers or your keys and phone. Complete with a mid-thigh length for additional warmth and protection from the elements, and a slim, flattering fit, the Faith jacket will have you wishing every season was jacket season.